John Richardson, the Town’s Sustainability Officer, recently answerd a few questions about sustainability in CHapel Hill. The email and John’s responses are below, with links to additional resources. EMAIL: I have been attending the meetings of the “Nurturing Our Community” Theme group of the Chapel Hill 2020 project. The purpose of this note is to ask about the existence and availability of some documents about CO2 emissions reduction. This topic is part of one of the Goals being developed by the Group, and these documents would augment understanding of the present status of planning of reductions, and what needs to be put into the new Comprehensive Plan. If you don’t mind, I will share your reply with the Group, if there is useful information. QUESTION 1. Was the following assessment done, and is it documented? ANSWER 1: There is an adopted reduction pledge for Town operations only. The milestones of that pledge can be found at link #1 below. Additionally, the University has a Climate Action Plan that relates to its own operations, as well as any activities planned for Carolina North (link #2 below). QUESTION 2. Are there reports of progress re the “emissions assessment for the community”, and a “county- reduction strategy”, mentioned in the following excerpt? ANSWER 2: The Town has collected data on greenhouse gas emissions from operations since 2005 (see image above). By looking at this report, you’ll notice an increase in most major sectors within Town Operations. These increases are largely due to rising service demand, which has resulted in the need for larger Town facilities, additional lighting, transit route expansions, etc. For example, from 2005 to the present, the Town has added major facilities like the Town Operations Center (Public Works and Transit) and the Homestead Aquatics Center. These facilities have added another 50% in total facility square footage for all Town facilities. The bright spots are things like the Town’s Green Fleets policy, which has reduced the emissions profile 8% below baseline despite an increase in the total number of non-Transit vehicles. The Transit fleet now has 14 hybrid-electric buses, which significantly increase the fuel economy of those vehicles. Additionally, with new facilities that are built to high performance guidelines (e.g., LEED), the Town now enjoys a greater energy efficiency per square foot as compared to the buildings that were replaced. With the installation of LED traffic signals, the Town is seeing significant savings in all Town-owned signals. As an LED City, the Town is currently working on a project to install LED lights in Town-owned parking decks to further reduce the energy load on those facilities. LED lights will also be studied in other applications such as facility driveways or parking lot lighting. Occupancy sensors are being installed in Town facilities to better match lighting levels with use of space. Regarding vehicle travel, the Town is implementing videoconferencing to minimize travel between facilities. And for vehicles that drive around Town, we are experimenting with electric vehicle technology and other low-carbon options such as biodiesel, compressed natural gas, hybrid technology, etc. Regarding community emissions, the Town has not undertaken a community-scale emissions inventory since the 2005 Countywide emissions inventory was completed (link #3 below). With regard to community energy consumption, the Town has implemented a grant-funded home retrofit program designed to generate energy savings of 15% or greater in all participating homes (link #4 below). The WISE program (worthwhile investments save energy) has a goal of retrofitting 500 homes by June of 2013. The average savings per home currently stands at 24% above baseline, with nearly 100 homeowners pledged to participate. QUESTION 3. 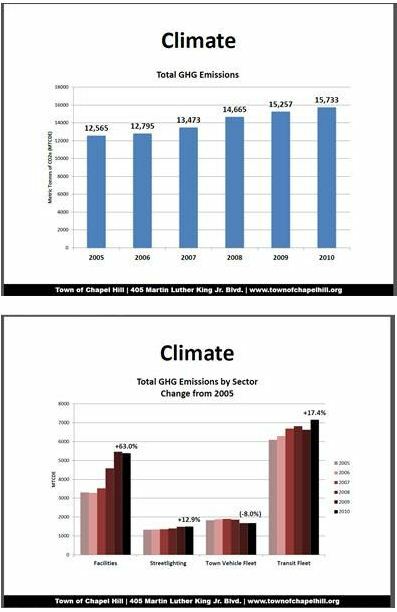 Has an emissions inventory for Chapel Hill similar to the Carrboro study (see following) been prepared? ANSWER 3: Per the response to question #2, the most recent community-scale inventory was completed at the county level in 2005. Furthermore, I would underscore the claim made by the Carrboro authors that extracting Carrboro (or Chapel Hill) specific data from the County-wide inventory can be difficult.